The Vista 17"x11" Acrylic Screwpost Portfolio Book - Onyx (Matte Black) can be customized with Color Imprinting or Laser Engraving. 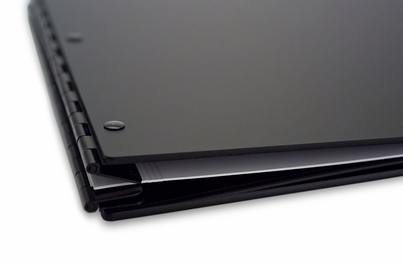 The Vista 11"x8.5" Acrylic Screwpost Portfolio Book - Onyx (Matte Black) + 20 Archival Sheet Protectors can be customized with Color Imprinting or Laser Engraving. 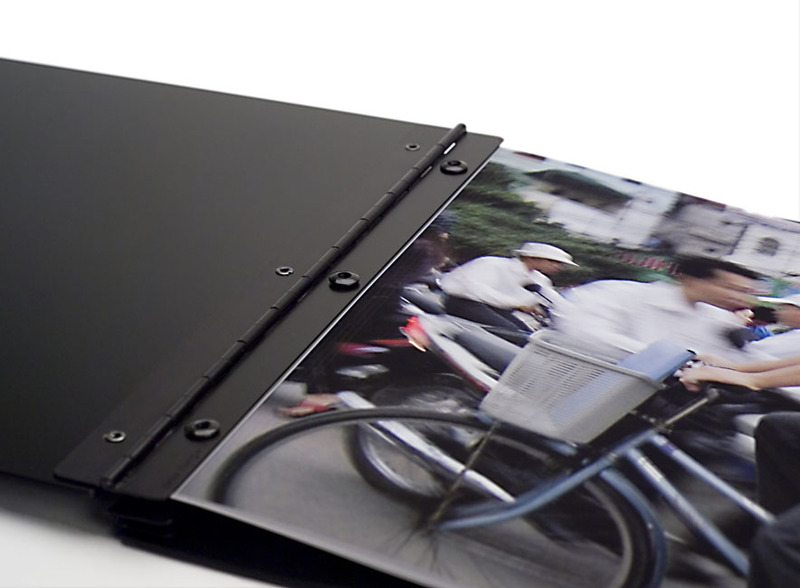 The Vista 11"x14" Landscape Acrylic Screwpost Portfolio Case - Onyx (Matte Black) + 20 Archival Sheet Protectors can be customized with Color Imprinting or Laser Engraving. The Vista 11"x17" Landscape Acrylic Graphic Design Screwpost Portfolio Book - Onyx (Matte Black) + 20 Archival Sheet Protectors can be customized with Color Imprinting or Laser Engraving. The Vista 19"x13" Acrylic Screwpost Portfolio Book - Onyx (Matte Black) can be customized with Color Imprinting or Laser Engraving. The Vista A4 Size Acrylic Screwpost Portfolio Book - Onyx (Matte Black) + 20 Archival Sheet Protectors can be customized with Color Imprinting or Laser Engraving. 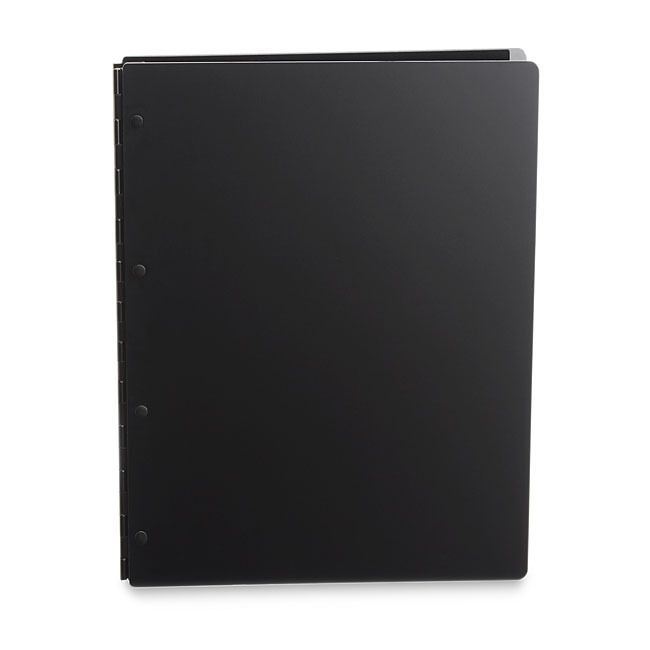 The Vista A3 Size Acrylic Screwpost Portfolio Book - Onyx (Matte Black) + 20 Archival Sheet Protectors can be customized with Color Imprinting or Laser Engraving. The Vista A4 Size Landscape Acrylic Screwpost Portfolio Book - Onyx (Matte Black) + 20 Archival Sheet Protectors can be customized with Color Imprinting or Laser Engraving. The Vista 13"x19" Landscape Acrylic Screwpost Portfolio Book - Onyx (Matte Black) can be customized with Color Imprinting or Laser Engraving. 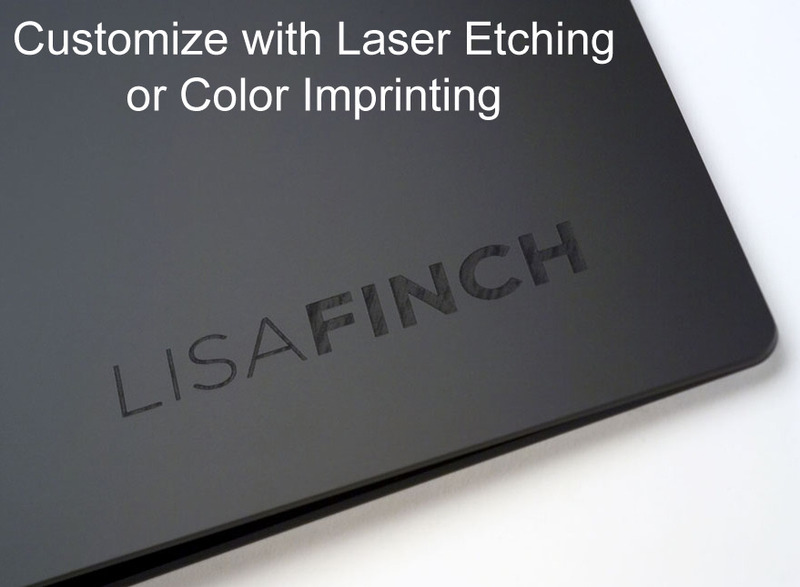 The Machina 17"x11" Aluminum Screwpost Portfolio Book can be customized with Color Imprinting or Laser Engraving. The Vista 17"x11" Acrylic Screwpost Portfolio Book - Snow (White) can be customized with Color Imprinting or Laser Engraving. Made of acrylic panels, Vista Acrylic Screwpost Photography Portfolio Books are both durable and beautiful. Choose from black, white, red, or frosted acrylic to make the right impression. The base price includes the front and back covers and 3/4" screwpost mechanism. Customize your Vista screwpost portfolio by using the selection boxes on this page to choose from the following accessories: Archival Page Protectors, Adhesive Hinge Strips, Black Zippered Nylon Jacket or Padded Transport Jacket, and Screwpost Extension Pack (1/2" and 1/4" extensions). Select your choice of accessories from this page then click the ORDER button to add your completely customized screwpost portfolio kit to the shopping cart. Made of acrylic panels, Vista Matte Black Acrylic Screwpost Portfolio Books are both durable and beautiful. Choose from black, white, red, or frosted acrylic to make the right impression. The base price now includes 20 archival sheet protectors along with the front and back covers and 3/4" screwpost mechanism. Customize your Vista screwpost portfolio by using the selection boxes on this page to choose from the following accessories: Archival Page Protectors, Pre-Punched Inkjet Paper, Adhesive Hinge Strips, Black Zippered Nylon Jacket or Padded Transport Jacket, and Screwpost Extension Pack (1/2" and 1/4" extensions). Select your choice of accessories from this page then click the ORDER button to add your completely customized screwpost portfolio kit to the shopping cart. Made of acrylic panels, Vista Matte Black Acrylic Screwpost Portfolio Cases are both durable and beautiful. Choose from white or frosted acrylic to make the right impression. The base price now includes 20 archival sheet protectors along with the front and back covers and 3/4" screwpost mechanism. Customize your Vista screwpost portfolio by using the selection boxes on this page to choose from the following accessories: Archival Page Protectors, Pre-Punched Inkjet Paper, Adhesive Hinge Strips, Black Zippered Nylon Jacket or Padded Transport Jacket, and Screwpost Extension Pack (1/2" and 1/4" extensions). Select your choice of accessories from this page then click the ORDER button to add your completely customized screwpost portfolio kit to the shopping cart. Made of acrylic panels, Vista Landscape Acrylic Graphic Design Screwpost Portfolio Books are both durable and beautiful. Choose from white, red, or frosted acrylic to make the right impression. The base price now includes 20 archival sheet protectors along with the front and back covers and 3/4" screwpost mechanism. Customize your Vista screwpost portfolio by using the selection boxes on this page to choose from the following accessories: Archival Page Protectors, Pre-Punched Inkjet Paper, Adhesive Hinge Strips, Black Zippered Nylon Jacket or Padded Transport Jacket, and Screwpost Extension Pack (1/2" and 1/4" extensions). Select your choice of accessories from this page then click the ORDER button to add your completely customized screwpost portfolio kit to the shopping cart. Made of acrylic panels, these Landscape books are both durable and beautiful. Choose from white, red, or frosted acrylic to make the right impression. The base price includes the front and back covers and 3/4" screwpost mechanism. Customize your Vista screwpost portfolio by using the selection boxes on this page to choose from the following accessories: Archival Page Protectors, Pre-Punched Inkjet Paper, Adhesive Hinge Strips, Black Zippered Nylon Jacket or Padded Transport Jacket, and Screwpost Extension Pack (1/2" and 1/4" extensions). Select your choice of accessories from this page then click the ORDER button to add your completely customized screwpost portfolio kit to the shopping cart. Made of acrylic panels, these Landscape books are both durable and beautiful. Choose from white, red, or frosted acrylic to make the right impression. The base price now includes 20 archival sheet protectors along with the front and back covers and 3/4" screwpost mechanism. Customize your Vista screwpost portfolio by using the selection boxes on this page to choose from the following accessories: Archival Page Protectors, Pre-Punched Inkjet Paper, Adhesive Hinge Strips, Black Zippered Nylon Jacket or Padded Transport Jacket, and Screwpost Extension Pack (1/2" and 1/4" extensions). Select your choice of accessories from this page then click the ORDER button to add your completely customized screwpost portfolio kit to the shopping cart. Lightweight, strong, modern, and distinctive, Machina Aluminum Metal Screwpost Portfolios are crafted of satin finish aluminum and constructed to last a lifetime. The base price includes the front and back covers and 3/4" screwpost mechanism. Customize your Machina Screwpost Portfolio by using the selection boxes on this page to choose from the following accessories: Archival Page Protectors, Adhesive Hinge Strips, Black Zippered Nylon Jacket or Padded Transport Jacket, and Screwpost Extension Pack (1/2" and 1/4" extensions). Select your choice of accessories from this page then click the ORDER button to add your completely customized screwpost portfolio kit to the shopping cart. Made of acrylic panels, these books are both durable and beautiful. Choose from black, white, red, or frosted acrylic to make the right impression. The base price includes the front and back covers and 3/4" screwpost mechanism. Customize your Vista screwpost portfolio by using the selection boxes on this page to choose from the following accessories: Archival Page Protectors, Adhesive Hinge Strips, Black Zippered Nylon Jacket or Padded Transport Jacket, and Screwpost Extension Pack (1/2" and 1/4" extensions). Select your choice of accessories from this page then click the ORDER button to add your completely customized screwpost portfolio kit to the shopping cart.